Termites live in colonies in your wooden house stumps and will make a nest in one or more of them, one wooden house stump can house some one hundred thousand or more white ants, all working away to eat out the timber stump from the inside where you can not see them; leaving only a thin wooden outer shell after they are finished eating the timber. If your timber stumps DO NOT have ant capping, or what is known as a ‘stump cap’ in the trade, or the stump caps are old and showing signs of rust, there could be a small pin hole or a larger hole in the metal stump cap. Termites will eat their way up the middle of the wood stump to the top, find this hole and then make their way into the timber bearer and into the walls of your home all undetected by you until it is far too late! 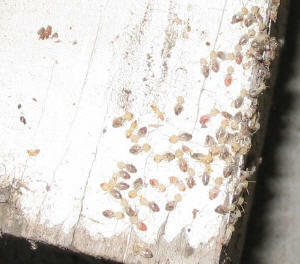 There are over 350 species of termites in Australia, of which some 20 species can damage timber homes. 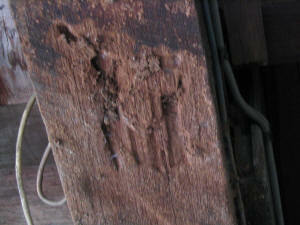 Note the termite trails above leading to cover and into the home? This elderly woman was led to believe that if she treated the termites every six months, this problem would be solved and all the termites would be gone, but sadly, that was not the case. You can see from the photo above that the white ants went right up the wooden stump, found a hole in the ant cap and went into the wooden bearer…Luckily in this case the stump was removed in time before the termites got into the home. 1. DO Be vigilant in checking your stumps every couple of months. 2. DO Call a pest control man to inspect your wood stumps, no less than every six months; it will be money well spent and regular inspections by a competent inspector, can save you thousands of dollars. 3. 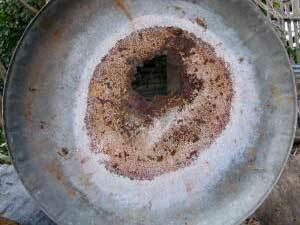 Look at the ant caps (stump caps) around the outer walls of your home for rust spots or rust holes, but also look under the ant caps as well, for any signs of rust. 4. Paint under the ant caps to make sure that moisture cannot cause rust spots. 5. 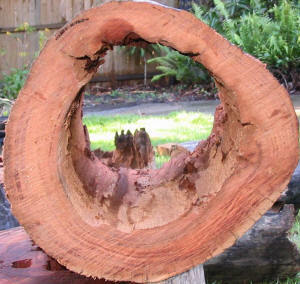 As wooden stumps get older, they are prone to start splitting and cracking. 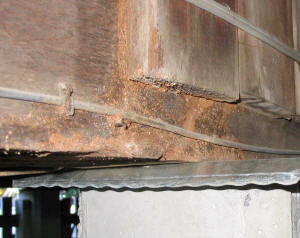 This is caused by the drying out of the timber, above ground level. As the cracks start to appear, treat as soon as possible with a ‘gap filler’ compound, as this will stop any moisture getting into the stump and causing dry rot from starting. It will also stop any ‘unwanted pests’ from making your wooden stump their home. 6. Check both your front and back steps under the bottom tread for signs of termite tracks or mounds. If your bottom step tread is very close to the ground, be very vigilant – for the closer to the ground that the step treads are, the easier it is for the termites to get into. 1. 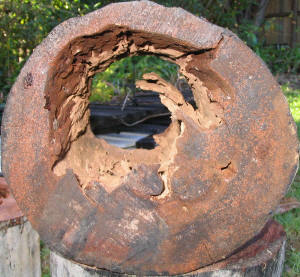 Do not leave old timber lying on the ground, or under your house on dirt or concrete, as this will attract termites. 2. Do not build gardens against your wooden stumps, or the wood palings between your stumps, as this will only attract termites faster, as does the pine bark used to cover the gardens to retain moisture. 4. Do not leave old cardboard packing boxes or tea chests around, as they too are termite food and good cover for them to move around under. 5. Do not leave a timber stack lying around on the ground under your home or in your back yard unless you keep the timber 150 to 200mm off the ground on besser blocks or house bricks. 6. Remove any old tree stumps in your yard and poison the area before filling the hole made by removing the old tree stump. Tree grinding is an option, but will only remove the bulk of the old tree stump and not the roots, which the termite will also remain in and use as food and as a conduit to travel underground in your yard. 7. Do not build garden edges from timber, pine or hard wood sleepers unless it is treated timber and is stated suitable for the purpose that you have in mind. 8. Retaining wall; Timber sleeper retaining wall pine or hardwood really should not be used where you are trying to hold back an amount of dirt. ‘Glenn Palframan House Restumping has just completed a partial restumping of my home. The work was carried out in an efficient and neat manner and to our complete satisfaction. He... Read More C.J. Thompson J.P.